As if solely to emphasise my arrival into the very highest echelons of New York society, I am attending an exclusive charity premiere of Casino Royale this evening. I can state categorically that it will be my favourite Bond film because I haven't seen any of the others, nor countless other flicks that I'm told are 'essential'. Unlike albums and books where I could put together a long list of truly inspiring experiences, films generally leave me stone cold. More specifically though, I struggle to take James Bond seriously mainly because he shares a squad number with Marcus Bent. Frankly it's an insult to some of the finest No.7s to have worn a Charlton shirt (Colin Powell, Robert Lee etc..). And to think that during that silly season in the 1990s when Charlton decided to categorise their players alphabetically (eg. No.1, Stuart Balmer), then Bond would have been forced to be 002 for a couple of films which might not pleased the folks in continuity. 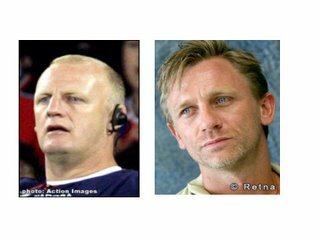 However with Iain Dowie now out of work, and Daniel Craig rumoured to be the ugliest James Bond so far (these things are all relative of course), then one wonders if any casting agents will be sniffing around our former 'head coach' to be the next to play Ian Fleming's secret agent? Surely Dowie would play arch-nemesis Jaws, not Bond himself?